Oooh! Sounds like MY kinda book! It looks like there are some new techniques in here that I would love to try. I love the beadwork of Kate McKinnon! Her beaded shapes are fabulous! I am sure this book is just what I need to help me achieve the next level of beading artistry! I have seen this book advertised, but have yet to buy it! It really looks like a good one! Thanks for a chance to win it. Yay! This look so cool! I would la la LOVE to win this (amazing!) set! Thanks for the chance to! I love using mixed media in my work, thanks for the chance to win this book. Mixed media...that is one book of info I don't have. I love the bracelet on the cover. Would love to add it to my collection! Architect is the perfect title for what we need to do sometimes. Would love to see this book. This sounds like an interesting book. Would love to win it. Sounds really interesting...new to beading , looking forward to starting my first project soon.. I like to win this book. I begin to make jewelery and I already made some crochet necklace, I love it. I'm sure I can learn new techniques. I have a question, I'am from Québec, Canada can I win on your site. 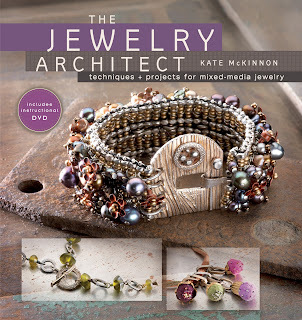 If I win, it would be my first book on mixed-media jewellery. Thank you, Cindy, for the opportunity. I would love to win this book! Having a DVD with it makes it even better! I am just starting to teach myself beading and am making your blue strung necklace at the moment. The book looks really interesting. I would love to win it. would love to learn some new techniques! OMG! What an awesome book! It would be FANTASTIC to win it. I would so love love this book to add to my very small collection. plus it comes with a dvd also to help even more. Sounds fab, I hope I'm not too late to enter!